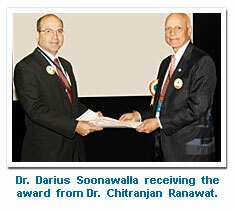 In recognition of his pioneering work in Minimally Invasive Hip and Knee Replacement surgery in India, Dr Darius Soonawalla received the Dr. Dholakia Award at the Advances in Hip & Knee Replacement Conference held in New Delhi, on March 1, 2008. He was selected for this award by world renowned orthopaedic surgeon Dr. Chitranjan Ranawat from the United States, who operated on former Prime Minister Atal Bihari Vajpayee a few years ago. designed and developed several surgical instruments.